Enjoy our free family liquors,book swap service & many types DVD to chose from. Free use of a laptop with internet facilities, keeping you in touch with the real world. 52’’ LCD TV with satelite in the spacious familly lounge \ dinning room, and lcd with dvd in all bedrooms. Enjoy dinner outside watching the breathtaking sunset and the lovely views from the terrace. 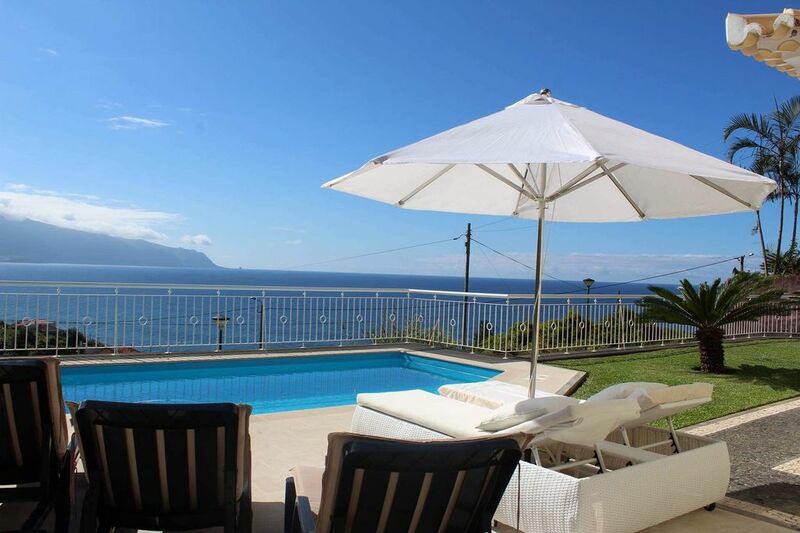 You must try Walking the many beautiful levadas to get the best of madeira and with the local pools & coast just minutes walk away, this makes Villa Quinze a perfect location to explore the natural wonders that madeira has to offer! fully equipped kitchen with all the utensils that you may need. Make the most of our heated pool and our games room with pin ball, table tennis, air hockey, game boards and play station with games, ideal for all the familys. Our family of 5 stayed for a week in December. The house was much larger than we expected (3 large bedrooms, 4.5 bathrooms, large kitchen, dining room, game room, closed garage), very spacious, clean, and comfortable. One tiny maintenance issue was rectified immediately. We also enjoyed the location with the sea view, nice village just a short walk away, avoiding the crowds of Funchal and the south coast while positioned to drive anywhere. We were a bit worried about weather on the north coast in the winter but it was no problem whatsoever. Highly recommended! Nuno’s Place was amazing. Really a fantastic house. It was in marvelous condition. We so enjoyed listening to the waves and the beautiful view from the balcony. The game room was such a fun place for our teens (and as a family too!). And the pool was heated, so we enjoyed it, even in November. His mom was such a delightful hostess that met us at the house and oriented us and even gave us a homemade cake. The only downside is that the location is so far from most things to do on the island. A car is a must. Possibly time of year was to blame, but there were very few dining options in Ponta Delgada during our stay (only once did we find a restaurant open), so we had to drive to other towns to eat, even on days that we stayed home. We are glad you and your family have enjoyed our house as much as we do. Look forward to seeing you back in the future. The villa was amazing. Everything you needed and more. The down side was very hard mattress. Plenty of towels, beautiful and clean. Pool was fantastic. Location great views stunning. Unfortunately we had builders next door all week so very noisy. And across the road a youths rave party playing loud music till 3am for two days. Absolutely stunning location and beautifully presented villa with all mod cons. So much nicer than Funchal but you will need a car. Do a jeep tour to see amazing views and learn about Madeira. Hi we are pleased you have enjoyed Madeira and specially our villa as much as we do. Once again thank you for choosing us. From the moment we arrived we knew this was going to be a super holiday. Nuno’s mum met us at the villa & provided us with tea, coffee & milk, plus chocolate cake, bread, jam & much more. The villa was beautifully prepared with Molton Brown hand wash & body lotion in every bathroom & loads of fresh towels. As the weather was not incredibly hot, the pool was heated, which was fab. However, the location & view were what made the holiday for us. Despite being less than an hour to Funchal, Ponta Delgada couldn’t be more different & the coastal road from here, through Sao Vicente to Porto Moniz was spectacular. The lava pools at Porto Moniz and the Acqua Natura Hotel were two of our favorite places to visit. We thoroughly recommend the villa and area to anyone who wants to do a bit more than just the big city because there’s so much more to see, especially in the north and north east of the country. Thank you Nuno and Sandra for sharing your villa with us - it’s truly a home from home! This villa is stunning and the pictures do not do it justice much bigger and more luxurious than we expected. Spotlessly clean and very well equipped. Nuno and his mum are very genuine people and will do anything to make your stay comfortable and enjoyable. Villa Quinze is a world away from the bustle of Funchal, but thanks to the new road system everywhere is now within easy reach 30 min. The island's top attractions are only a short drive away making this Villa the perfect home away from home, buses are regularly available but car hire is recommended to enjoy all the island has to offer. Ponta Delgada is a pleasant small village in the northern coast, nowadays famous for its ocean water swimming pool with its beach situated with in a protected bay. During your stay with us why not visit the caves of São Vicente and the Volcano Centre. If you prefer sea sports, Clube Naval can provide a variety of surf and windsurf equipments at your disposal. If you like to combine physical exercise with dazzling sceneries, then some local levada walks is for you. spa facilities and indoor pool can be found at monte Mar Palace. No mater what you choose, one thing i know you will be doing... siting back, relaxing, enjoying that well deserved HOLIDAY!!!! Booking Notes: Prices quoted are for two people, every additional person a supplement of £12 per person per day. Changeover days are flexible. Included at no extra cost: Welcome hamperI, Home made liqueurs, cleaning serves at the end of your stay, satellite TV games room, Free wireless Internet. Electricity, water, gas, Linen and towels provided. linen changed at beginning and end of stay. Pool heated only in the colder months.